There are some of you out there, very few I would imagine, who can remember when this blog reviewed books on a chapter-by-chapter basis. Those of you who do remember my experimental phase will remember that the second book that I looked at was The Prince of Mist by Carlos Ruiz Zafon. 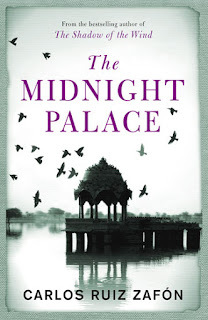 Turns out there's a series of children's/young adult's novels that he's written, of which my current subject of review, The Midnight Palace, is the second installment of. I had certain issues with the previous installment, so I wanted to see if they carried over to this newer story. The Midnight Palace starts in 1916 Calcutta, as a man desperately runs through the city streets, attempting to find safety for a set of newborn twins whilst being pursued by assassins intent on the children's deaths. The story then jumps forward 16 years, to the summer in which Ben and his friends grow out of the orphanage system that has been their home for all or most of their young lives. Coming together for a final meeting of their secret society, they stumble upon a mystery that is closely tied to Ben's unknown family past when Ben meets the sister that he never knew about. Much as he would like to get to know his sister better, Ben finds their reunion cut short as they are hounded by the same shadowy figure that tried to kill them as newborns. I'm kind of disappointed to say it, but Carlos Ruiz Zafon doesn't really seem to write young adult novels terribly well. Right, so I suppose that I should start with what I liked about The Midnight Palace, give me at least something positive to say here. So, I really liked the atmosphere of menace and uncertainty that the book manages to keep up for the majority of the plot. There's something palpably unnerving about a group of teenagers attempting to combat an entity that is so far beyond the scope of what they can even begin to deal with, and it's a source of tension that Zafon is very good at implementing and has implemented just as masterfully in his adult novels. It does get you rooting for the heroes quite effectively, a desire to see the underdog win as it were. Onto the first thing that I wasn't fond of. Apart from the villain Jawahal and the twins, the characters are practically two-dimensional. Possibly this is where The Prince of Mist benefitted, as that had a comparatively small cast. Here, there are eight teens to try and flesh out, and there just isn't enough room to give them anything more than a couple of superficial character traits. For example, there was one character whose sole characteristic shown in the narrative is that he's a fast runner. According to some of the narration, he can also pick locks like a champ, but it never comes up as a skill that he actually used. Not that it matters, since running and lock-picking are not personality traits. Sure, one can imply certain things from someone who is good at these skills, but really those are traits that should be shown directly. There's another character whose sole trait is that she's the female member of the group. Practically nothing else. It's frustrating as I started reading Zafon's work via his adult works, The Shadow of the Wind specifically, where there is a large cast that still manages to be vivid and interesting and utterly heartbreaking. So to see the cardboard cut-out excuses of characters in The Midnight Palace gives me no end of frustration, because I have seen him do so much better when he gives himself room to breathe. The second thing that bothers me is the ending. Up until the ending, I was having a reasonably good time. Sure, the characters were flatter than pancakes, but the mystery was engaging and I wanted to see how the villain could be overcome. My disappointment with the ending is twofold and kind of spoilery, so if you still want to read the book, I'd advise maybe skipping to the summary at the end of the review. Okay, so firstly, it's disappointing because Zafon wrote almost the exact same ending in The Prince of Mist: the villain is exorcised, but only at the cost of the life of one of the protagonists, hanging over the lives of the rest of the cast from then onwards. I don't mind there being thematic or symbolic similarities between the two books if they're meant to be part of a series, but when your ending follows the same pattern, then I start wondering what the point of reading any of the other installments is. Secondly, it just smacked of adult bitterness and in terms of tone, it just felt wrong. Up until the final confrontation between Ben and Jawahal, it had been a young adult book, leaning more towards the younger end of the genre's age range. The ending itself would have been more fitting in an adult novel about childhood and growing up, because it just felt too bitter to appeal to an audience of around the same age as the characters. I guess that I'm disappointed because up until then, there had been an emphasis on the family that a person chooses for themselves through their friendships, and the cast's desire to hold onto it even as they moved into the uncertainty of adult life. It's a theme that I can really get behind, but it was all dashed by an epilogue that could be more or less summed up as "everyone has died or will die alone and isolated from humanity." I tell you, it's saying something when the young adult's book has a bleaker ending than the violent and mercenary world of Joe Abercrombie's books, and it's nothing good. Sure, make the ending bittersweet if it makes sense, but there comes a point where you may as well have not bothered with the narrative at all if the finale makes everything a pyrrhic victory that the author hasn't signposted well enough.